I've watched the first 3 episodes on H..U already and I like this anime so far. Story isn't too deep at all but it's great animation and cool battle scenes so far. Worth your attention if it actually becomes available here on CR... It's still Wednesday here in the US east coast. I'll especially like watching it here without commercials! Ignore the hate, and just see for yourself! This show and story in general as been getting some negativity, but despite that im enjoying whats come out so far. I really don't know why it's being poorly received, but at the very LEAST the animation is fantastic! Ufotable is at it again. As for the storyline, I can see it isn't some revolutionary plotline, but I definitely enjoy this series thus far. 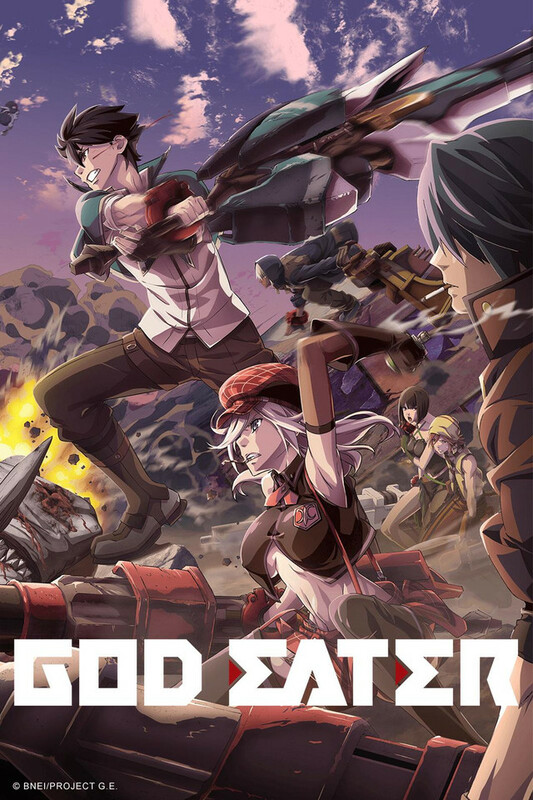 As someone who played and loved the original game on PSP (which the show is based off of) I had very high hopes for God Eater the anime. It hasn't been released on CR yet, but I have watched the first few episodes elsewhere and I am happy to report that it does NOT disappoint. If you are looking for a Shonen styled - Tokyo 20XX title along the lines of old school Shin Megami Tensei, then look no further! This is a pretty badass anime from just watching the first episode. Im curious to where it goes with the story line. Started kinda slow but the action and anime in here are pretty sick. I now wanna read the mange if there is one. Finally been looking for a good action anime that will keep me watching. Finally something as good as Tokyo Ghoul √A . I have bin waiting to be stolen by a Good story worthy of the popcorn and friends . If you have not watched anything good lately or just have in a state of boredem this will capture your interest my prediction instant GOLD classic. A reccommendation to give it a try! For everyone who is expecting some overly deep plot (Ergo Proxy, Kara no Kyoukai, etc.) please just stop complaining. That is literally no reason to hate on a series like this. This is based on a really good game. I have played and I know that what's coming will be good. Also They really simplified the entire battle sequences with many of the Aragami. Like in episode 4, Gboro Gboro does not get one shot... ever. It's medium sized, still takes quite awhile with the whole team to take it down. But let's be real here. No one is going to watch an entire episode of them trying to complete one monster hunter-esque mission. I'd say Ufotable is doing a fine job. God Eater: Worth the hype? BADASS ! IM HOOKED AFTER 1 EPISODE! LOVE IT! I LIKE THE RPG FEEL TO THIS ! FOOTSTEPS SOUND EFFECTS ETC. NOTHING IS CLICHE. THIS WILL BE AN EPIC SERIES I HOPE THEY HAVE ALOT OF EPISODES AND NO FILLERS . TAKE MY MONEY I WOULD BUT THIS WHOLE SERIES! THE SUSPENSE AND THE ENDLESS POSSIBILITIES AWAIT! JUST DO IT. MAKE YOUR DREAMS COME TRUE. In the humble words of Shia Le'B00f..."JUST DO IT." I definitely recommend checking out this anime after watching the first episode. Animation is great and kinda reminds me of Black Bullet (it might not for you but that's ok) and I really need a new ongoing anime to watch now that all of my favorites are practically over....T_T Battle scenes are nice, episode one is explosive, can't wait for more. The animation is SUPERB. No surprise considering its ufotable. The source material which it was based off of is a game, so unfortunately you're not gonna get a great story. The MC is copy paste of any typical battle anime. He's an angst filled boy who grew up in a dystopian setting. And of course he is the "chosen one" and teams up with a "famous group that everyone heard of". Sound familiar? It should considering these are the basic tropes that exist in most battle anime. If you're looking for a refreshing take on a rehashed genre, this is not it. If you're looking for a show with great animation but mediocre story and characters, this is for you.